After he reconnects with an awkward pal from high school on Facebook, a mild mannered accountant is lured into the world of international espionage. 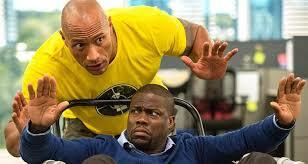 I love Kevin Hart and watch everything he is in but I have to say this was not one of his best movies. Don't get me wrong, I did enjoy it and had a few laugh out loud moments but it just didn't sit high up on his movie list for me. Dwayne Johnson wasn't as good as I have seen him in other movies either but they did the best they could with the script they were given. What I did love was the message this movie had, that no matter who you are in high school or if people bully you, When you finish school you can go on and be who ever you want to be. People bully others because of their own issues and to feel power. Don't let them have that power over you. A nice little movie, not the comedy of the year but worth a watch.